unlike the allegorical ubiquitous scotsman, i have no great love of hogmanay. true, in part this is due to my teetotalness which not only excludes me from the bulk of the seasonal celebrations, but most often finds me marvelling at the state some folks get themselves into. it has therefore been something of a welcome diversion to have been frequently asked to play drums at a local hostelry on new year's eve. that way, i get to wear my sobriety with far less peer group disapproval and protect myself from inebriated happy new year kisses and cuddles. disappointingly the last few years have been devoid of such celebratory percussiveness due to a change in policy invoked by said hostelry. however, in the days when end of year fun and frolics were still in vogue it was salutory to witness the number of visitors who had chosen to spend their new year on islay, presumably enticed by eight distilleries, but also by a not altogether deserved reputation as the place to be at new year. never was this more clearly demonstrated by the preponderance of the male visitors who arrived with their nether regions clothed in tartan kilts. while this is hardly inappropriate dress for hogmanay celebrations, it was more the surprised look on their faces when discovering that the local revellers were not similarly dressed. a classic example of national typecasting, one that i will agree is often despicably reinforced by national tv over that particular holiday period. it's a suspicion i may have briefly harboured on witnessing the scottish winter cap proffered by canada's red dots cycling. 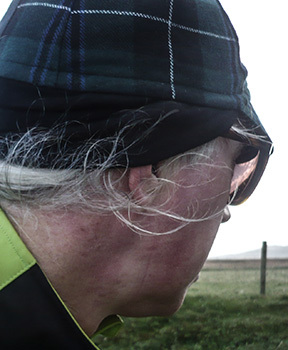 the immediate reaction, though well-versed in the sort of winters that can be experienced in northern north america, was to question just what made red dots cycling au fait with the sort of winters experienced by kilt-wearing, billy connolly anunciating scots cyclists. in fact, i believe it may have been my impertinent tweets concerning its consitution and weatherproofing that led to richard sending a finely crafted example of canadian tartan to the homeland for the purposes of review. the winter cycling cap is hardly a recent invention. the very epitome of a cosily fabricated casquette, featuring an entirely necessary peak (for winter days of bright, low sun and others with driving precipitation) thoughtfully coupled with a rear flap to pull down over the ears on colder days. the flexibility of such headgear is the ease with which that flap can be flipped upwards in warmer conditions. 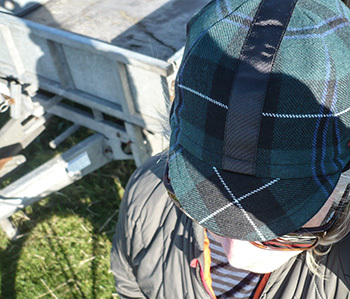 however, hand-building an example from a bamboo cotton/wool mix, woven into a dark tartan does not necessarily qualify the scottish winter cap as a requisite head-covering for a scottish winter. i'd be fibbing slightly if i characterised our current climatic conditions as being the depths of a scottish winter, but there's no doubt that things are certainly heading that way. 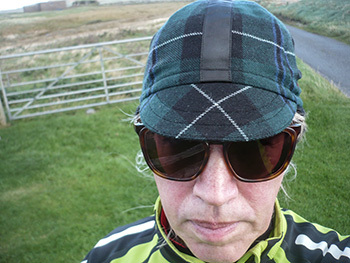 in the process of gauging the effectiveness of the recently reviewed endura overshoes, i wore the cap under my bright green helmet, peak down as demanded by our faux flandrien heritage. i'm not the archetypal hard man that i'd like others to think i am, but there's little doubting the efficacy of riding in windchill enforcing, gale force winds and heavy showers with a winter cap, peak down. and there's no denying that the tartan material is an effective wind barrier; additionally, the frequent showers failed to permeate its cotton/wool fabric, though it's eminently possible that a sustained downpour might not be so kind. temperature wise, it's hard to fault the concept. 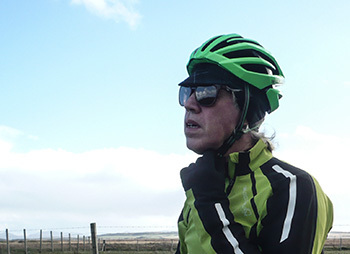 that ear flap was most welcome when struggling into an atlantic headwind and every bit as versatile on reaching debbie's where the indoor temperature demanded a cooler approach. flipping the flap, while probably breaking one or two sartorial rules, was immensely practicable. i may possibly have to come back to you over the course of the ensuing months, when winter bites just a little bit harder, but on current evidence, my concern level is sitting at zero. 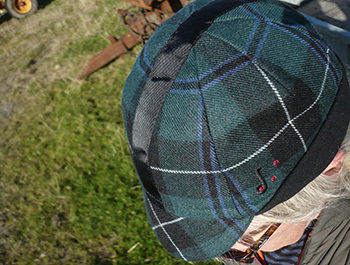 it's also a cap that works every bit as well when ridden al fresco (gaelic for, without helmet) when in stylish commuter mode. mind you, whether its tartan persona works quite as well south of the border (or even in british columbia) i'm probably not well qualified to judge. but just like those kilts worn on hogmanay, perhaps it will confer all the favourable aspects of tartan culture upon the wearer. maybe i'm reaping the benefits of scottish typecasting.